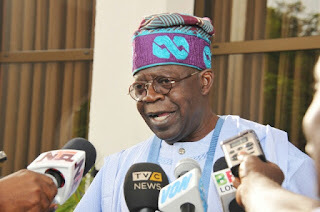 Bola Tinubu, national leader of the All Progressives Congress (APC), Bisi Akande, former interim leader of the ruling party were absent when President Muhammadu Buhari hosted members of his party at the presidential villa in Abuja on Monday. Vice-President Yemi Osinbajo; Senate President Bukola Saraki; Yakubu Dogara, speaker of the house of representatives, were in attendance. Also at the meeting were current and past state governors of the ruling party, members of the national assembly, Boss Mustapha, secretary to the government of the federation (SGF), and other cabinet ministers. The politicians gathered ahead of the national executive council (NEC) meeting scheduled for APC headquarters on Tuesday. According to NAN, one of the major issues was the review of the APC constitution and consideration of report on true federalism as well as other matters. Nasir el-Rufai, governor of Kaduna state, chaired the APC committee on true federalism. The committee looked at 12 issues including merging of states, fiscal federalism and devolution of power.